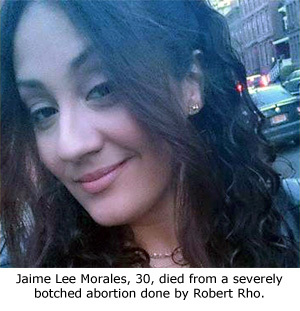 Queens, NY –Jamie Morales was an apparently happy and healthy 30-year old woman when she walked into the Liberty Women’s Healthcare office in Flushing, New York, on July 9, 2016, for an elective second trimester abortion. By evening, she was dead. 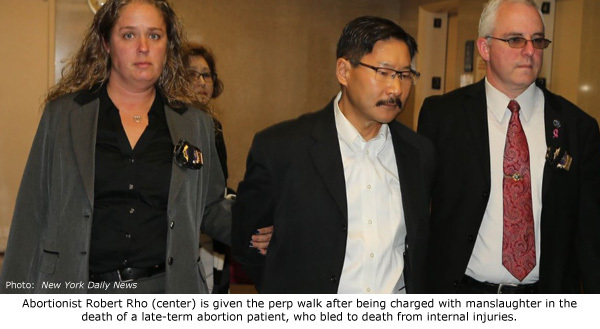 In a rare case of criminal prosecution of an abortionist for causing the death of a patient, Robert Rho, was arrested on October 11, 2016, after a Grand Jury issued an indictment against him for Second Degree Manslaughter (Reckless Homicide), a Class C Felony that carries a penalty of 3 1/2 to 15 years in prison. Rho thought that the abortion on Morales went without complication until staff noticed she was bleeding heavily in the recovery room. Rho determined that she required a second abortion procedure, but even that did nothing to control the bleeding. Morales continued to bleed and feel woozy, and even collapsed once at the clinic. Even though Rho had to she was too unstable to release, he discharged Morales to her sister, who put Morales in her car and began the trip to the sister’s home in the Bronx. Along the way Morales fell off the back seat and became non-responsive as the result of continued hemorrhaging. Morales was transported by ambulance to a Bronx-area hospital where she was pronounced dead later that evening. An autopsy revealed horrific internal injuries inflicted by Rho during one or both abortion procedures he conducted on her that day. Rho had lacerated her cervix, punctured her uterus and sliced her uterine artery. Any one of those injuries would cause heavy bleeding, but together, they proved catastrophic. Had Rho not released Morales in her unstable condition, and instead called an ambulance, she might be alive today, and Rho would only be facing the possibility of a malpractice suit instead of jail time. Soon after Morales’ death, Rho surrendered his medical license and closed his abortion facility. However, at his arraignment on the day of his arrest, Rho pleaded not guilty and was released on $400,000 bail. Since then his case has been postponed eleven times with no clear reason for the delay. Rho’s next court appearance appears on the Queens Supreme Court “Trials AM” calendar online for November 28, 2017, but there is some doubt that the case will be resolved even then.